Alexander III sought to bring Scotland’s western seaboard under Royal control and, after diplomacy failed, he initiated a war that led to a large Norwegian force entering the Clyde. 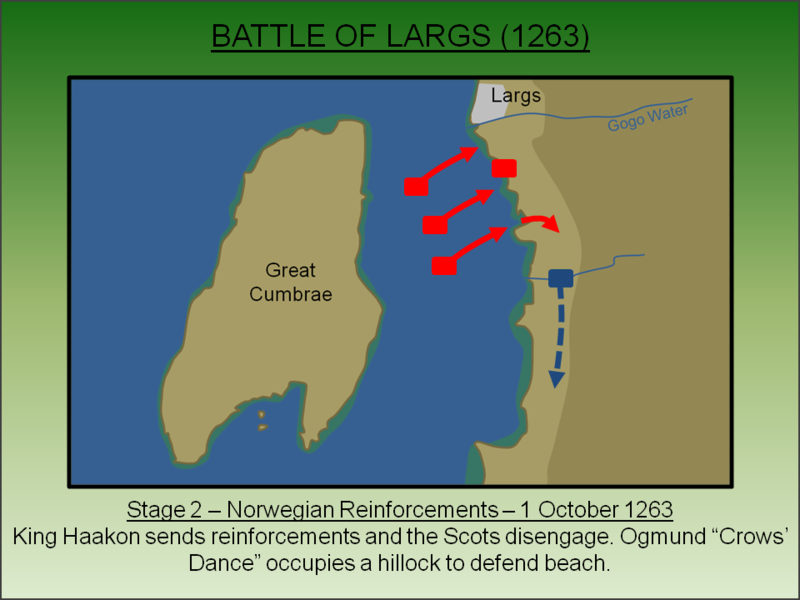 Scottish forces engaged it at the Battle of Largs (1263) and, although tactically the encounter was a stalemate, it heralded the end of Norwegian influence in the west. By early-thirteenth century, the Scottish monarchy had given up unrealistic aspirations of extending their southern border and had started to focus on the western seaboard. Since 1098, when King Edgar of Scotland had given up Scottish claims on the area, the Inner and Outer Hebrides along with most of modern day Argyll and Bute, had been predominately under Norwegian control. Alexander II launched campaigns in 1221 and 1249 both aimed at expanding his influence in the Inner Hebrides but died during the latter of these leaving his seven year old son, Alexander III, as King. Years of relatively weak minority rule followed with no further attempt to wrest overlordship from Norway. However, after achieving his majority, Alexander III resumed his father’s work. In 1261 he sent an embassy to the court of King Haakon IV in an attempt to purchase the Outer Hebrides but his offer was rejected and his ambassadors arrested. In 1262 he tried a more forceful approach and dispatched William, Earl of Ross to capture Skye prompting the Norwegian King to raise a large force in preparation for an invasion to reassert Norwegian control. King Haakon IV sailed from Bergan in July 1263 with a force of between 120-200 ships. He advanced via Orkney and the Outer Hebrides to gather more forces from his liegemen there and then attacked the Inner Hebrides. Most local lords resumed their complaisance towards the Norwegian King with just one, Ewen MacDougall, resisting the large force. He then sailed around Kintyre and into the Clyde where the Scots attempted a negotiated settlement. But this was a ruse designed to give them time and at Ayr, some 20 miles east of Arran, an army was being assembled to engage the Norwegians as soon as they came ashore. With the negotiations ended, the Norwegians sailed through the Cumbrae gap into the Upper Clyde where Haakon divided his forces sending a large element to attack Lennox (Dunbartonshire) on the River Clyde. 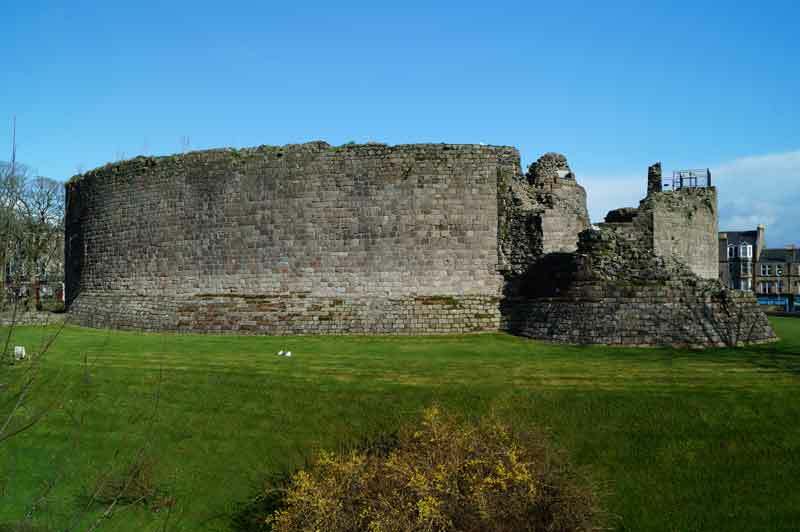 The remainder of the force attacked Bute where Rothesay Castle surrendered without a fight. 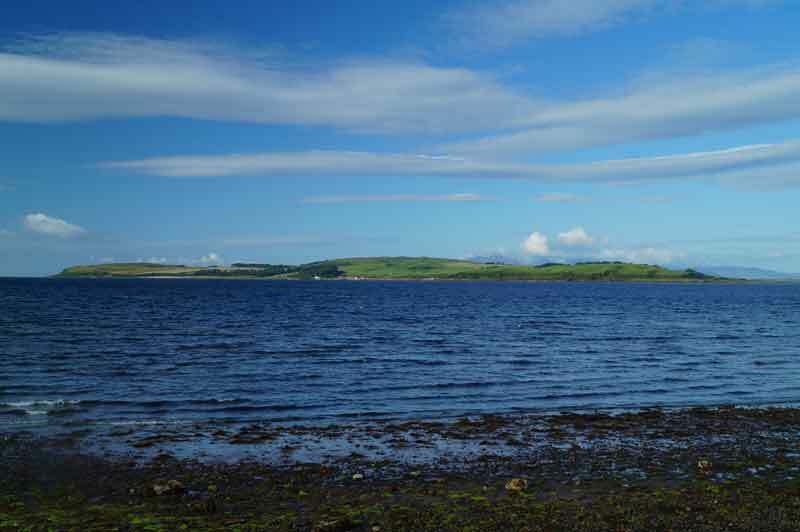 The Norsemen then captured Great Cumbrae island to use as a base for further attacks. However on the night of 30 September/1 October, whilst their forces were beached on this island, stormy weather dominated by a strong westerly wind blew a number of the Norse ships from their berths onto the hostile Scottish mainland just south of Largs. Abandoning these boats, essential for mobility of the army and sustaining operations, was inconceivable and a small forces was landed to repair and recover them. Meanwhile the Scottish army, some 25 miles south at Ayr, began advancing towards Largs. 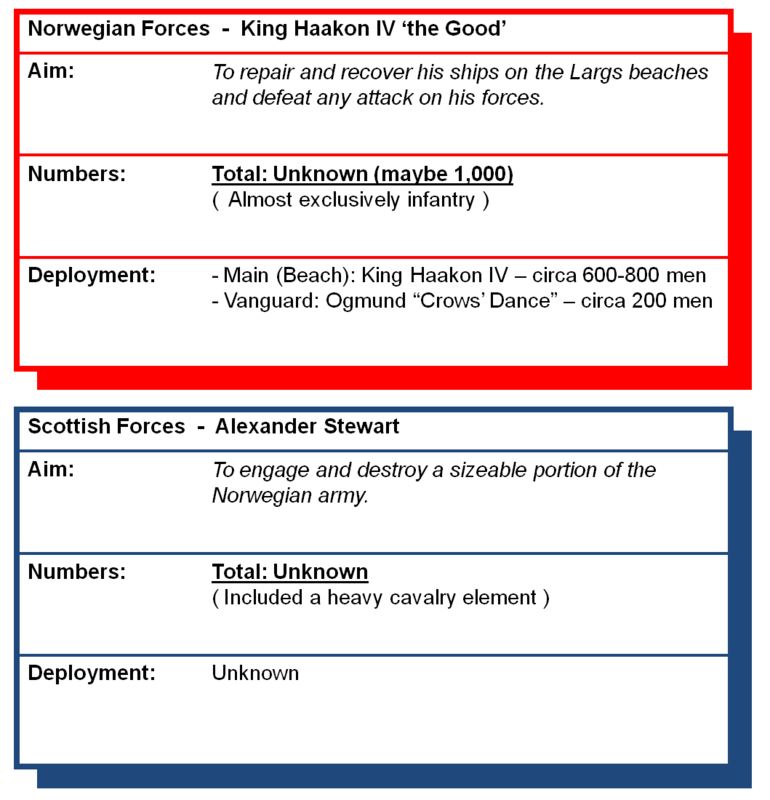 The total number of Norwegian forces available to King Haakon on 1/2 October is unknown. The size of his fleet is generally believed to have numbered in the region of 120 to 200 ships which, on a conservative analysis of crew numbers, would put his force around 6,000-10,000 strong. However his dispatch of a significant portion of his men to attack Lennox would have significantly reduced his overall numbers. Furthermore it is not clear whether he left any soldiers at Bute or on Great Cumbrae. It is therefore entirely conceivable that the numbers he deployed at the Battle of Largs was fewer than 1,000 men. The Scottish force is believed to have been under the command of Alexander Stewart whose father, Walter, was the King's hereditary steward. Contemporary accounts record a cavalry force of 1,500 heavy (armoured) cavalry although this is almost certainly vastly exaggerated - it could well have been less than 100. Regardless, they were supported by a significant infantry element recruited from Ayrshire and the locality. Like the overall numbers present, details of the action at Largs are sketchy at best with conflicting accounts. Deriving a narrative for the battle is also frustrated in that the precise location is debated although it is widely believed to have taken place south of the Gogo Water. The repair crews for the stricken Norse ships came under attack from Scottish forces. The size and extent of these strikes is unknown although the contemporary accounts record use of projectile attacks - perhaps archers or slingers. The attacks were significant enough for the Norse crews to abandon their work and defend themselves seemingly suffering some casualties during this action. King Haakon detaches a significant force from his army on Great Cumbrae who land on the mainland to protect the teams repairing the ships. As they land the Scots disengaged and a detachment of Norsemen, around 200 men strong under Ogmund “Crows’ Dance”, took control of a hillock overlooking the beach to prevent any attacks. No further action was recorded that day and the Norwegian forces camped ashore overnight. On the morning of 2 October 1263, King Haakon came ashore himself to oversee the salvage effort perhaps frustrated by the lack of progress. However, the main Scottish force was now in the immediate vicinity advancing from the south. Their vanguard slewed right to engage the Norsemen on the hillock. It is not clear who was getting the best of the fighting on the hillock but it seems the main Scottish force might have attempted to push on towards the beach. Certainly the Norsemen on the hill increasingly became concerned they were being cut-off from their ships and started drawing back towards the sea. The withdrawal was orderly at first but became increasingly urgent. - Stage 5: Norwegian Rout? The retreat of Ogmund's men from the hillock unsettled the main Norse army on the beach. Seeing their troops rush down from the hillock they assumed they had been routed and order began to break down. 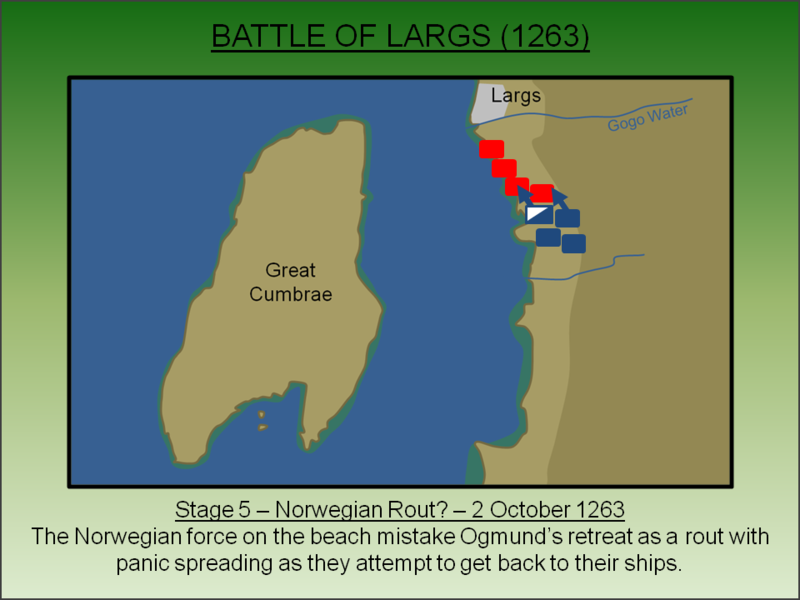 The Norwegians seem to have suffered heavy casualties at this stage as the Scots launched heavy cavalry charges across the beach. The Norsemen fled to their ships. Accounts of how the battle ended vary. Some authors suggest the Scots pursued and slaughtered the Vikings in great numbers. Others that the Norsemen fought a fierce battle at the beachhead, retained their foothold overnight and, on the morning of 3 October 1263, re-floated their ships and departed. Either way, it was the Norwegians who left and the Scots who retained the field. On paper the Battle of Largs resulted in a stalemate with neither of the two armies achieving its primary aim. However, within a few months of the battle, it became clear that a significant Scottish victory had been achieved. 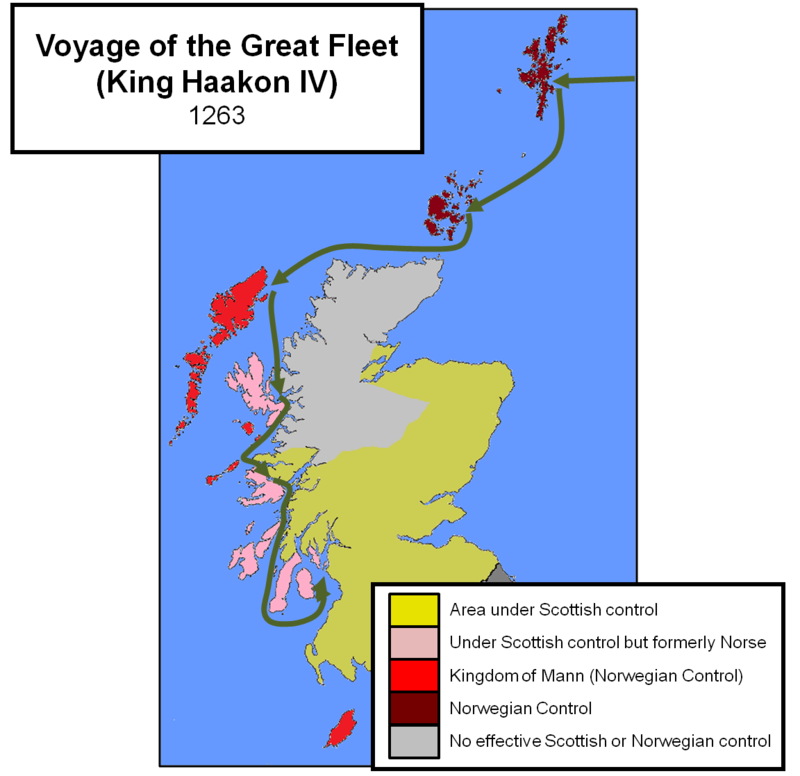 After the battle King Haakon IV had withdrawn his fleet from the Clyde and returned towards Norway but, given the weather at that time of year, his progress was slow and in December 1263 he died at Kirkwall, Orkney. His successor, Magnus IV, was in no place to launch expeditions against Scotland and abandoned his claim on most of the Scottish islands in exchange for a substantial payment which was ratified in the Treaty of Perth (1266). Along with punitive expeditions against the local lords who had sided with Haakon, this brought most of the Outer Hebrides and the Isle of Mann under the authority of the Scottish Crown although it would be many years before effective Royal control was exercised in all these areas. In the interim period the so-called Lordship of the Isles developed under Clan MacDonald. Battlefields Trust (undated). Largs Battlefield Report. Bremner, R. L (1911). The ancient accounts of the Battle of Largs. Glasgow. Hall, M. B (1974). Largs, and Society District Historical. The Battle of Largs. Largs and District Historical Society, Largs. Lancaster, J.H.D (2015). Largs: Battlefield visit notes and observations. CastlesFortsBattles.co.uk. MacLennan J. M (1933). The decisive battles of Scotland: The Battle of Largs. Scots Magazine. Ordnance Survey, 2015. Largs. 1:1250. Southampton. Ordnance Survey, 2015. North Ayrshire. 1:1250. Southampton. The site has been heavily developed although the general terrain still affords a good appreciation of the battle. 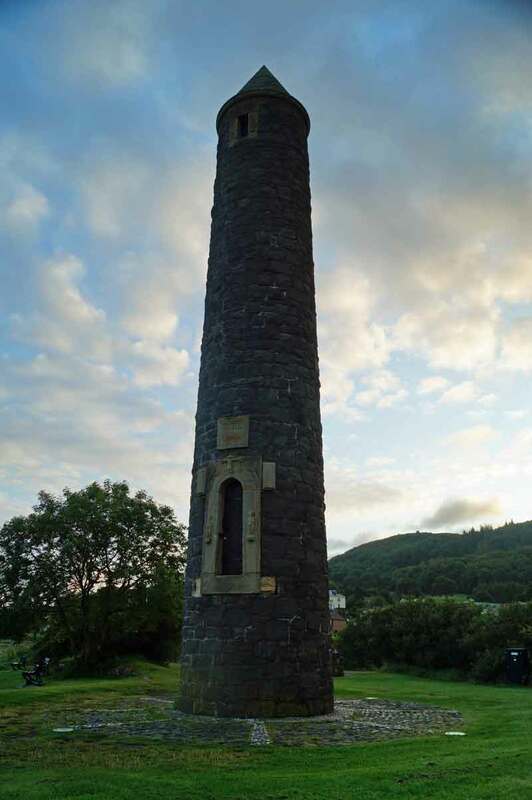 A dedicated monument (known as the Pencil) was erected to commemorate this important Scottish battle. Voyage of Haakon IV. With a fleet of between 120-200 ships, the Norwegian King sailed first to Shetland, then Orkney and Lewis before working his way south re-establishing his links with the local rulers. He arrived off Arran in September 1263. After the defeat at Largs he returned via the same route (although did not stop at Lewis) but died at Kirkwall in Orkney before he could reached Norway. His death paved the way for the Treaty of Perth (1266) which brought the Western Isles under Scottish control in exchange for a substantial payment. Viking Ship. 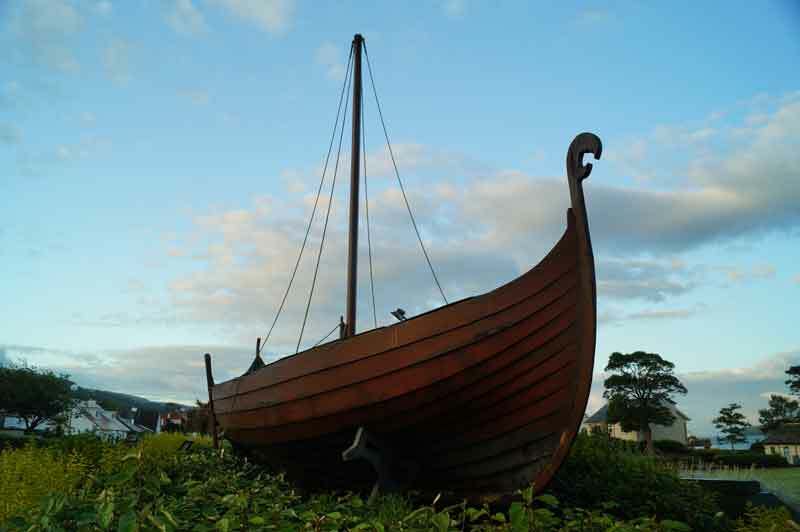 The Largs waterfront has various Viking themed attractions including a scale model of a long boat. The Vikings were superb ship-builders whose vessels constantly weathered the high seas yet were also fast and with a shallow draught. Pencil Monument. A large monument has been erected to commemorate the battle. Standing Stone. 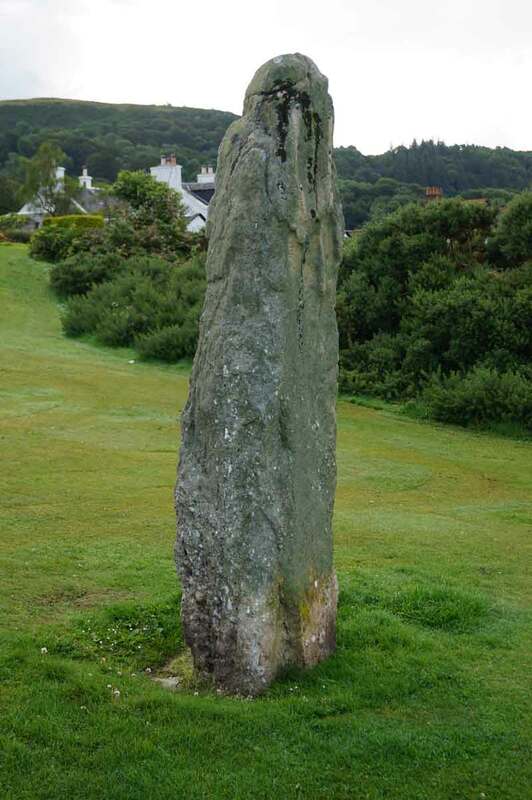 A standing stone on the coast has long been associated with the battle although it is uncertain whether there is any factual basis in this claim. Largs Waterfront. The beach north of the pencil monument and south of the Gogo water is probably where the fighting took place. Modern developments have narrowed it but the terrain can still be appreciated. The picture looks south - the direction from which the Scottish army advanced. The flat, open ground of the beach would have been ideal for the Scottish cavalry. Rothesay Castle. Haakon’s first target in the Clyde was the island of Bute, once a Norwegian territory but in 1263 was held for the King of Scots by his hereditary steward whose authority was anchored by Rothesay Castle. Faced with overwhelming Norse forces the castle surrendered without a fight. Points of interest are spread along the coastline and it is well worth taking the time to walk its length, taking in the superb views of Great Cumbrae and the Clyde. There are numerous car parking facilities in the vicinity including options for on-road parking.